The Vehicle Information System provides GPS navigation, camera, trip computer, maintenance reminders, tire pressure monitoring display, and other useful vehicle information from the truck’s J1939 bus. The Android operating environment allows web browsing, wireless updates, and mobile applications to make this system a powerful tool for enhanced productivity. The user operates the system through a 6.5″ color display and touch screen that is specifically designed for clean installation in truck dashboards. Direct connection to the vehicle’s J1939 bus. 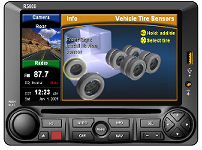 This unit combines radio, CD player, iPod Docking, Satellite radio, Camera system tire-pressure monitoring (TPMS), integrated Navigation and GPS, Hands-free Bluetooth, Qualcomm OmniVision interface and advanced engine, truck, and trip monitors into a single integrated system designed specifically for use in Tractor Trailer Vehicles. The R5000HT combines navigation, tire-pressure monitoring (TPMS), a rear-view camera system, advanced engine and trip monitors, broadcast and Sirius satellite radio, and CD/MP3 into a single integrated system designed specifically for use in Heavy Trucks. 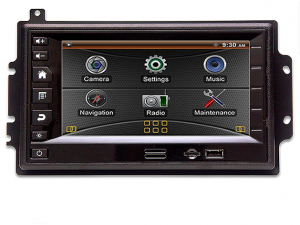 This unit combines radio, CD player, iPod Docking, Satellite radio, camera system, tire-pressure monitoring (TPMS), integrated Navigation and GPS, Hands-free Bluetooth, Qualcomm OmniVision interface and advanced engine, truck and trip monitors into a single integrated system specifically for use in Tractor Trailer Vehicles. The Lectronix R5000 combines radio, CD/MP3 player, rear-view camera system, and advanced engine, coach, and trip monitors into a single integrated system designed specifically for use in RVs (Recreational Vehicles).